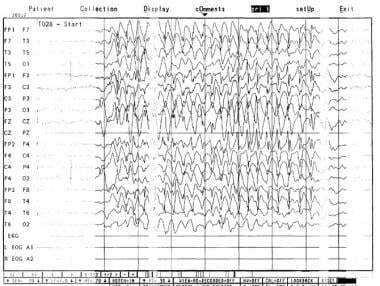 Early clinical investigations documented the ability of AEEG to record identifiable focal and generalized epileptiform activity. [6, 7] In 1982, Ives introduced a 16-channel AEEG that utilized signal multiplexing. The 16 channels allowed improved spatial resolution and localization but recorded discrete samples rather than continuous EEG. In the past decade, computer technology has enabled portable recording of up to 36 channels with sampling rates of up to 400 Hz. Currently, numerous AEEG systems are available commercially (see the image below). Components of an ambulatory EEG system. AEEG has several important clinical applications. [13, 14, 15, 16, 17] Depending on the clinical suspicion, other diagnostic tests (eg, ambulatory cardiac monitoring, polysomnography [PSG] or inpatient video/EEG monitoring [18, 19] ) may be more appropriate in a given situation. A clinical suspicion of epilepsy can be confirmed by recording a seizure on AEEG. [20, 21] This is most likely to occur when the patient is experiencing daily or almost daily spells. Studies looking at the diagnostic yield of AEEG indicate that 6-15% of AEEGs record seizures. In patients with intractable epilepsy, AEEG has been used to localize seizure onset as part of presurgical evaluation. However, inpatient video/EEG monitoring remains the standard for presurgical evaluation. Detection of interictal epileptiform abnormalities in the absence of recorded seizures can provide supporting evidence for a clinical diagnosis of epilepsy. Studies have demonstrated that 34.9% of patients with known seizures had a positive AEEG, whereas 15.3% of 216 patients in whom the diagnosis of seizures was considered (ie, patients with episodic alterations of behavior, perception, sensation, or motor functioning) had interictal epileptiform abnormalities on 4-channel AEEG. When a 16-channel recorder was used, 38% of patients who were referred for AEEG had some type of epileptiform abnormality. AEEG is highly specific; spikes were found on overnight AEEG in only 0.7% of asymptomatic adults without a history of migraine or a family history of epilepsy. In patients with a history of migraine headaches and those with a family history of epilepsy, the incidence of spikes on AEEG was 12.5% and 13.3%, respectively. Some patients in whom epilepsy is suspected have a normal routine or sleep-deprived EEG. In these patients, AEEG can increase the chance of detecting an epileptiform abnormality. Of patients who previously had normal or nondiagnostic routine EEG, 12-25% have epileptiform activity on AEEG. A study comparing the usefulness of sleep-deprived EEG and computer-assisted 16-channel AEEG in patients with suspected epilepsy (but a nondiagnostic initial routine EEG) found that sleep-deprived EEG improved detection of epileptiform discharges by 24%, whereas AEEG improved detection by 33%. Of the 46 patients studied, 15% had actual seizures recorded on AEEG, and none had seizures during the sleep-deprived recording. Patients may have epilepsy without interictal epileptiform abnormalities on EEG, but this occurs in fewer than 20% of patients. In a study using a 4-channel recording system, 3 patients had only seizures recorded without interictal abnormalities. AEEG with 16 or more channels increases the probability that interictal epileptiform abnormalities will be found. For a patient to have seizures and yet be unaware of them is not uncommon. [30, 31] Brief alterations of awareness occur in both absence and complex partial seizures. AEEG is helpful at identifying seizures that are unrecognized or unreported by the patient. An 8-second burst of generalized 3-Hz spike and wave captured on an ambulatory EEG. Patients with complex partial epilepsy are often amnestic for their seizures. The sequelae of a nocturnal generalized convulsive seizure, if present at all, may be so subtle (eg, fatigue, muscle soreness) that the patient is unsure whether a seizure actually occurred. A study of patients in an epilepsy monitoring unit found that 63% of all seizures were unrecognized by the patients. This difficulty in identifying the occurrence of seizures impedes seizure diagnosis and assessment of treatment adequacy. Liporace et al found that the AEEGs of 3 patients (of 46) demonstrated seizures that were not designated as events by the patients. Tatum et al found that more than one third of AEEGs with ictal activity contained at least one seizure that was unreported by the patient. These studies demonstrate the utility of AEEG at capturing unsuspected events. Because a significant number of patients are unaware of their seizures, responses to treatment are frequently difficult to gauge. Patients with mental retardation or other forms of encephalopathy may be unable to report seizures accurately. In such cases, AEEG can have a significant impact on clinical management. AEEG is particularly useful in quantitating response to the treatment of absence seizures. If untreated, such seizures typically occur numerous times per day; adequate treatment usually normalizes the EEG. Certain diagnoses are difficult to confirm with the typical 20-minute outpatient EEG. The interictal epileptiform discharges of benign rolandic epilepsy, for example, are highly activated by sleep and may not always be achieved adequately in a laboratory. Continuous spike and wave activity during slow-wave sleep is another entity that may demonstrate a relatively normal EEG during waking hours and a strikingly abnormal EEG during deep sleep. If a nonepileptic sleep disorder is suspected, PSG is the preferred study because of the added information from monitoring electromyography (EMG), eye movements, electrocardiography (ECG), and respiration. The history may not differentiate clearly between a sleep disorder and epilepsy. AEEG may record frequent arousals (suggesting sleep apnea) or decreased rapid eye movement (REM) sleep latency (suggesting narcolepsy). In a study of 500 patients who had AEEG, narcolepsy was suggested in 6 patients, including 3 in whom narcolepsy had not been suspected. Pseudoseizures are surprisingly frequent, occurring in as many as 20% of patients at epilepsy referral centers and in 5-20% of outpatient populations. Some patients have both pseudoseizures and epileptic seizures; coincident events occur in an estimated 10-60% of epilepsy patients. AEEG can be a useful screening tool in identifying patients who have nonepileptic paroxysmal events. In one study, 36% of patients had event marker activations without associated electrographic changes. Potential problems exist in using AEEG to definitively diagnose nonepileptic seizures. A 24-hour recording without associated video does not allow evaluation of clinical stereotypy, which is valuable when evaluating patients with unusual seizure manifestations and minimal EEG changes. Scalp EEG may not show electrographic ictal abnormality during some frontal lobe seizures or may show only subtle abnormalities that would be difficult to interpret without associated video. Seizures and nonepileptic seizures may be associated with movement and muscle artifact that may obscure the underlying EEG. Although AEEG may be a useful initial screening tool for nonepileptic events, inpatient video/EEG monitoring remains the criterion standard in evaluating nonepileptic seizures. AEEG may be helpful in evaluating syncope or near-syncope if an ECG lead replaces 1 of the EEG channels. If cardiogenic syncope is suspected, a Holter monitor or prolonged cardiac event monitor may be more useful clinically. Although arrhythmias have been diagnosed with continuous ambulatory EEG/ECG recording, a study of epileptiform abnormalities in AEEG found that only 1 of 67 patients with syncope, near-syncope, or episodic dizziness had an epileptiform abnormality. Seizure anticipation methods are under development to identify EEG changes before seizure onset, allowing ongoing assessment of the probability of seizure occurrence. [41, 42, 43, 44, 35, 45, 46, 47, 48] With further characterization of EEG changes in the preictal state, future AEEG recording may be coupled with a seizure anticipation device, providing a time window within which therapeutic intervention may prevent a seizure. Disk electrodes should be applied with collodion to ensure stability during the 24-hour recording period. Electrode gel may have to be reapplied by syringe beneath the electrodes. The patient’s scalp may be wrapped in gauze and the lead wires gathered and tacked to reduce traction on the electrodes (see the image below). New batteries should be provided every 24 hours. Patient with scalp electrodes, carrying an ambulatory recorder. Calibration is recorded using a 50-µV square wave or pulse; each electrode should be tapped sequentially. This part of the recording should be reviewed while the patient is in the laboratory to verify the integrity of the system and the appropriate connection of electrode leads to the preamplifier. Patients should be instructed to record activity in a diary. Documenting physiologic artifacts, such as eye movements, chewing, speaking, and swallowing, is useful. Patients should not chew gum, which could produce a prolonged artifact. In addition, they should not bathe with the device. When the patient returns to the laboratory for removal of the device, the end of the recording should be reviewed to ensure that signal recording was maintained. In the past, when 4- and 8-channel AEEG was in use, montage design was of paramount importance in capturing and attempting to localize a suspected discharge. Because abnormalities were recorded most often in the anterior temporal regions and frequently in the frontal regions, montages were designed to optimize coverage of these regions and to maximize yield. With the newer digital 16- to 36-channel AEEG systems, standard EEG montages are usually adequate, since digital reformatting is always an option. Additional electrodes at T1/T2, zygomatic, and sphenoidal locations may allow more specific localization. Because AEEG records a vast amount of data, scanning techniques are necessary to decrease review time. Cassette 8-channel systems allow scanning at speeds of 20, 40, and 60×. They also allow audio output monitoring. Although isolated, single discharges may be difficult to perceive at these speeds, seizures are less likely to be missed, because of the longer on-screen time, the ability to recognize of rhythmic or evolving patterns, and the presence of rhythmic audio bursts (usually of declining frequency). Further refinements have reduced the incidence of false positives due to physiological artifacts and sleep patterns. Neural network modeling techniques may offer additional advantages in the future. Because AEEG is done outside the controlled confines of the EEG laboratory and while the patient performs customary daily activities, it is susceptible to a variety of physiologic and environmental artifacts. Such artifacts may be difficult to recognize in AEEG, especially if a limited number of channels are in use. Artifacts from sustained blinking, chewing, or movement may obscure the underlying EEG. Additionally, rhythmic artifacts due to repetitive activities (eg, teeth brushing, scratching, or bicycle pedaling) may mimic seizure activity. Ideally, the patient diary will document these occurrences. Judicious use of filters, gain, and reformatting may further clarify these waveforms and assist in distinguishing seizure activity from artifact. Electroencephalographic seizures usually demonstrate evolution of amplitude and frequency, may spread to involve neighboring electrodes, and may be followed by postictal slowing or suppression. If doubt exists as to whether a discharge is artifactual or epileptic, a conservative interpretation should be followed. Goodwin E, Kandler RH, Alix JJ. The value of home video with ambulatory EEG: a prospective service review. Seizure. 2014 Jun. 23 (6):480-2. [Medline]. Dash D, Hernandez-Ronquillo L, Moien-Afshari F, Tellez-Zenteno JF. Ambulatory EEG: a cost-effective alternative to inpatient video-EEG in adult patients. Epileptic Disord. 2012 Sep. 14(3):290-7. [Medline]. Holter NJ. New method for heart studies. Science. 1961 Oct 20. 134:1214-20. [Medline]. Marson GB, McKinnon JB. A miniature tape recorder for many applications. Control Instrumentation. 1972. 4:46-47. Quy RJ. A miniature preamplifier for ambulatory monitoring of the electroencephalogram [proceedings]. J Physiol (Lond). 1978 Nov. 284:23P-24P. [Medline]. 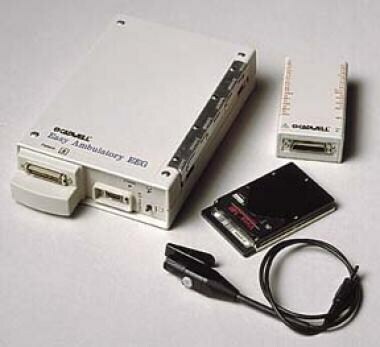 Ives JR. 4-channel 24 hour cassette recorder for long-term EEG monitoring of ambulatory patients. Electroencephalogr Clin Neurophysiol. 1975 Jul. 39(1):88-92. [Medline]. Ives JR, Woods JF. A study of 100 patients with focal epilepsy using a 4-channel ambulatory cassette recorder. In: Scott FD, Raftery EB, Goulding L, eds. ISAM 1979: Proceedings of the Third International Symposium of Ambulatory Monito. 1980. 383-392. Ives JR. A completely ambulatory 16-channel cassette recording system. Stefan H, Burr W, eds. Mobile Long-Term EEG Monitoring: Proceedings of the MLE Symposium. New York: Fischer; 1982. 205-17. Bridgers SL, Ebersole JS. Ambulatory cassette EEG in clinical practice. Neurology. 1985 Dec. 35(12):1767-8. [Medline]. Ebersole JS. Ambulatory cassette EEG. J Clin Neurophysiol. 1985 Oct. 2(4):397-418. [Medline]. Ebersole JS, Leroy RF. A direct comparison of ambulatory cassette and intensive inpatients EEG monitoring in detecting interictal abnormalities. Electroencephalogr Clin Neurophysiol. 1982. 53:21P. Ebersole JS, Leroy RF. An evaluation of ambulatory, cassette EEG monitoring: II. Detection of interictal abnormalities. Neurology. 1983 Jan. 33(1):8-18. [Medline]. American Electroencephalographic Society. Guideline twelve: guidelines for long-term monitoring for epilepsy. American Electroencephalographic Society. J Clin Neurophysiol. 1994 Jan. 11(1):88-110. [Medline]. Gilliam F, Kuzniecky R, Faught E. Ambulatory EEG monitoring. J Clin Neurophysiol. 1999 Mar. 16(2):111-5. [Medline]. Schomer DL. Ambulatory EEG telemetry: how good is it?. J Clin Neurophysiol. 2006 Aug. 23(4):294-305. [Medline]. Velis D, Plouin P, Gotman J, da Silva FL,. Recommendations regarding the requirements and applications for long-term recordings in epilepsy. Epilepsia. 2007 Feb. 48(2):379-84. [Medline]. Michel V, Mazzola L, Lemesle M, Vercueil L. Long-term EEG in adults: sleep-deprived EEG (SDE), ambulatory EEG (Amb-EEG) and long-term video-EEG recording (LTVER). Neurophysiol Clin. 2015 Mar. 45 (1):47-64. [Medline]. Alper K. Nonepileptic seizures. Neurol Clin. 1994 Feb. 12(1):153-73. [Medline]. Alix JJ, Kandler RH, Mordekar SR. The value of long term EEG monitoring in children: a comparison of ambulatory EEG and video telemetry. Seizure. 2014 Sep. 23 (8):662-5. [Medline]. Webber WR, Litt B, Wilson K, Lesser RP. Practical detection of epileptiform discharges (EDs) in the EEG using an artificial neural network: a comparison of raw and parameterized EEG data. Electroencephalogr Clin Neurophysiol. 1994 Sep. 91(3):194-204. [Medline]. Seneviratne U, Mohamed A, Cook M, D'Souza W. The utility of ambulatory electroencephalography in routine clinical practice: a critical review. Epilepsy Res. 2013 Jul. 105(1-2):1-12. [Medline]. Morris GL. The clinical utility of computer-assisted ambulatory 16 channel EEG. J Med Eng Technol. 1997 Mar-Apr. 21(2):47-52. [Medline]. Morris GR, Galezowska J, Leroy R. The results of computer-assisted ambulatory 16-channel EEG. Electroencephalogr Clin Neurophysiol. 1994 Sep. 91(3):229-31. [Medline]. Zetterlund B. Quantification of spike and wave episodes in 24-hour tape recordings of EEG. Stefan H, Burr W, ed. Mobile Long-Term EEG Monitoring: Proceedings of the MLE Symposium. New York: Fischer; 1982. 237-244. Zetterlund B, Bromster O. A system of quantification of spike and wave episodes in 24-hour tape recordings of EEG. Dam E, Perry JK, ed. Advances in Epileptology: XIIth Epilepsy International Symposium. New York: Raven Press; 1981. 361-364. Tatum WO, Winters L, Gieron M, et al. Outpatient seizure identification: results of 502 patients using computer-assisted ambulatory EEG. J Clin Neurophysiol. 2001 Jan. 18(1):14-9. [Medline]. Schomer DL, Ives JR, Schachter SC. The role of ambulatory EEG in the evaluation of patients for epilepsy surgery. J Clin Neurophysiol. 1999 Mar. 16(2):116-29. [Medline]. Schachter SC, Ito M, Wannamaker BB, et al. Incidence of spikes and paroxysmal rhythmic events in overnight ambulatory computer-assisted EEGs of normal subjects: a multicenter study. J Clin Neurophysiol. 1998 May. 15(3):251-5. [Medline]. Liporace J, Tatum W 4th, Morris GL 3rd. Clinical utility of sleep-deprived versus computer-assisted ambulatory 16-channel EEG in epilepsy patients: a multicenter study. Epilepsy Res. 1998 Nov. 32(3):357-62. [Medline]. Blum DE, Eskola J, Bortz JJ. Patient awareness of seizures. Neurology. 1996 Jul. 47(1):260-4. [Medline]. Fattouch J, Di Bonaventura C, Lapenta L, Casciato S, Fanella M, Morano A, et al. Epilepsy, unawareness of seizures and driving license: the potential role of 24-hour ambulatory EEG in defining seizure freedom. Epilepsy Behav. 2012 Sep. 25(1):32-5. [Medline]. Keilson MJ, Hauser WA, Magrill JP. Ambulatory cassette EEG in absenceepilepsy. Pediatr Neurol. 1987 Sep-Oct. 3(5):273-6. [Medline]. Foley CM, Legido A, Miles DK, et al. Long-term computer-assisted outpatient electroencephalogram monitoring in children and adolescents. J Child Neurol. 2000 Jan. 15(1):49-55. [Medline]. Gates JR, Mercer K. Nonepileptic events. Semin Neurol. 1995 Jun. 15(2):167-74. [Medline]. Gulick TA, Spinks IP, King DW. Pseudoseizures: ictal phenomena. Neurology. 1982 Jan. 32(1):24-30. [Medline]. Gumnit RJ. Psychogenic seizures. Wyllie E, ed. The Treatment of Epilepsy: Principles and Practice. Philadelphia: Lea & Febiger; 1993. 692-695. Saygi S, Katz A, Marks DA. Frontal lobe partial seizures and psychogenic seizures: comparison of clinical and ictal characteristics. Neurology. 1992 Jul. 42(7):1274-7. [Medline]. Trimble MR. Pseudoseizures. Neurol Clin. 1986 Aug. 4(3):531-48. [Medline]. Kanner AM, Morris HH, Luders H. Supplementary motor seizures mimicking pseudoseizures: some clinical differences. Neurology. 1990 Sep. 40(9):1404-7. [Medline]. Lai CW, Ziegler DK. Syncope problem solved by continuous ambulatory simultaneous EEG/ECG recording. Neurology. 1981 Sep. 31(9):1152-4. [Medline]. D'Alessandro M, Vachtsevanos G, Esteller R, et al. A multi-feature and multi-channel univariate selection process for seizure prediction. Clin Neurophysiol. 2005 Mar. 116(3):506-16. [Medline]. Jerger KK, Netoff TI, Francis JT, et al. Early seizure detection. J Clin Neurophysiol. 2001 May. 18(3):259-68. [Medline]. Le Van Quyen M. Anticipating epileptic seizures: from mathematics to clinical applications. C R Biol. 2005 Feb. 328(2):187-98. [Medline]. Le Van Quyen M, Martinerie J, Navarro V, et al. Characterizing neurodynamic changes before seizures. J Clin Neurophysiol. 2001 May. 18(3):191-208. [Medline]. Osorio I, Harrison MA, Lai YC, et al. Observations on the application of the correlation dimension and correlation integral to the prediction of seizures. J Clin Neurophysiol. 2001 May. 18(3):269-74. [Medline]. Protopopescu VA, Hively And LM, Gailey PC. Epileptic event forewarning from scalp EEG. J Clin Neurophysiol. 2001 May. 18(3):223-45. [Medline]. Shoeb A, Schachter S, Schomer D, Bourgeois B, Treves ST, Guttag J. Detecting Seizure Onset in the Ambulatory Setting: Demonstrating Feasibility. 2005. Waterhouse E. New horizons in ambulatory electroencephalography. IEEE Eng Med Biol Mag. 2003 May-Jun. 22(3):74-80. [Medline]. Leroy RF, Ebersole JS. An evaluation of ambulatory, cassette EEG monitoring: I. Montage design. Neurology. 1983 Jan. 33(1):1-7. [Medline]. Gotman J. Automatic detection of seizures and spikes. J Clin Neurophysiol. 1999 Mar. 16(2):130-40. [Medline]. Gotman J. Automatic recognition of epileptic seizures in the EEG. Electroencephalogr Clin Neurophysiol. 1982 Nov. 54(5):530-40. [Medline]. Gotman J. Automatic seizure detection: improvements and evaluation. Electroencephalogr Clin Neurophysiol. 1990 Oct. 76(4):317-24. [Medline]. Koffler DJ, Gotman J. Automatic detection of spike-and-wave bursts in ambulatory EEG recordings. Electroencephalogr Clin Neurophysiol. 1985 Aug. 61(2):165-80. [Medline]. Litt B, Lehnertz K. Seizure prediction and the preseizure period. Curr Opin Neurol. 2002 Apr. 15(2):173-7. [Medline]. Disclosure: Serve(d) as a director, officer, partner, employee, advisor, consultant or trustee for: Brain Sentinel, consultant.<br/>Stakeholder (<5%), Co-founder for: Brain Sentinel.